I may get another one of these, because I tend to plug in my cordless drill battery charger and leave it charging for more than a day, which seems wasteful. This would limit the charge to 6 hours. Belkin also has an energy use monitor called the Conserve Insight, which would help figure out what devices are using the most power. Ultimately, the Belkin Conserve is a good thing, but wouldn’t it be great if a device like the iPad could communicate with its charger to tell it when to turn off? It’s all Apple hardware, so I’d think engineering a charger that knows when it’s done charging (based on communicating with the iPad via the USB cable) would be a good thing. Apple could add one more “green” feather to its environmental cap. P.S. 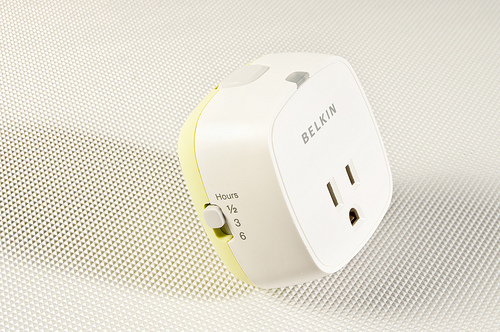 Amazon has the Belkin Conserve Socket for less than $10. Posted on Tuesday, July 19th, 2011 at 5:00 am. Subscribe to the comments feed. Both comments and pings are currently closed. Post on your own blog. Wait, I’m confused. Doesn’t it turn itself off automatically? Or does it just block flow to the device that’s plugged into it? Otherwise what’s the point of a device designed to stop using electricity if you can’t turn it off? Whoops! Sorry Tom, I guess I wasn’t clear. I’ve clarified my statement above. What I meant was, if you push the button to turn it on, you can’t push it again to turn it off. You need to unplug it if you decide not to use it. I hope that make sense. Ah, okay, so it does actually shut completely off and cease to draw current once the timer has elapsed, but if you decide halfway through a 6-hour timer that you’re done with it, you have to physically unplug it. There’s no cancel button. Gotcha, thanks for the clarification! Do you power cycle your computers every day? Like turn them off at the end of the work day and turn them on when you sit down at them? If you assume an electrical cost of 12.57 cents per kilowatt hour in Wisconsin (http://www.eia.gov/cneaf/electricity/epm/table5_6_a.html), then a 10 watt device costs 0.1257 cents per hour. Assuming you charge it for 3 hours a day, that costs you .3771 cents for 3 hours per day, or $1.37 per year, assuming 365 days per year usage. Without it, I suppose your iPad would sit on the charger for about 10 hours per day, costing you 1.257 cents for per day, or $4.58 per year. That means it saves you only $3.21 per year. At $10, this thing would take 1,136 days to pay for itself in energy savings. Secondly, I doubt the iPad uses the full 10 watts when plugged in and in sleep mode. Gabe, some of the computers are on 24 hours a day, though I did switch to a laptop from an old overpowered PC for the Linux server, and another machine does get shut down or at least put to sleep a lot more than it used to. And just to be clear, I’m in no way suggesting I’m somehow saving the planet, but I’d like to use less power if possible. Chris, I would compare the cost of having the charger plugged in 24 hours per day/365 days per year. Because of where it’s plugged in, it’s inconvenient to unplug it, so I never did. I’m assuming it still draws power, even if the iPad is not plugged in, is that correct? Even if that’s not correct, I would occasionally leave it charging for 12 – 18 hours easily, and after it’s at 100%, it just seems like I’m wasting energy. Besides my lack of understanding about energy costs… did anyone have thoughts about chargers that could shut themselves off? Good idea? Useless? The amount of power the charger uses when the iPad is not plugged is trivial… probably less than 0.1 watts at a minimal voltage. 10 watts is the maximum amount that the iPad uses… with broadcasting Wifi, a busy CPU, with the screen at max brightness, while charging the battery. If the iPad is just sitting on the charger, doing nothing but maintaining a network connection, maintaining battery charge, with the screen off, you’re only going to use a fraction of that… probably 2-4 watts. I’m guessing here; I don’t have data on this. All I’m saying is that the iPad is already an extremely low power device with aggressive power management, and the Belkin gadget would probably be better suited to something that uses a lot more energy, like those mentioned on their website which you linked to. To put things in perspective, running an electric clothes dryer for just one hour uses more power than your iPad does in a year. Damn you and your math skills! So maybe I’ll look into using it with the larger battery chargers for my power tools. Or maybe for charging the batteries for the RED ONE… those are pretty beefy batteries, so I’m assuming they draw a lot of power. Are we concerned about the rising cost of energy? Also of note, we’ve been using a clothesline whenever possible rather than the electric dryer, so hopefully that counts for something. Actually, I forgot to mention the one place I really need this thing… plugged into my soldering iron! I’ve managed to leave that thing plugged in for 6 hours after I was done using it. For that I’m not concerned about wasting energy as much as I am with destroying the iron or something else. For what its worth, I have a griffin PowerJolt Dual I use in my vehicles, when its supplying power to something, the light on that side of the plug turns on, with my bluetooth/iphone/friends 1st gen ipad, it happily displays its green light until the device is charged, and the light turns off. If only my Garmin was as smart. it’s charger stays on 24/7 unless I remember to unplug it. Also, if your trying to figure out usage in your home/office, you can always get a Kill-A-Watt, if you do some searching they can be had for $10-15. Not as gimmicky as the Belkin, but would allow you to see what your devices are using.. Thanks Andrew… I’ve been meaning to pick up a Kill-A-Watt for a while now. I’m definitely more interested in measuring power usage after this conversation.